UK prime minister Theresa May says social networks must stop being “passive hosts” for extremism, and all illegal content should be removed automatically. "These companies have some of the best brains in the world,” May told the World Economic Forum in Davos, Switzerland. “They must focus their brightest and best on meeting these fundamental social responsibilities." At a time when social media companies are under intense scrutiny for their behaviour, May also urged tech investors to vote with their wallets and consider the social impact of the companies they support. She cited an example from earlier this year when shareholders asked both Twitter and Facebook for detailed reports on abuse, electoral interference, threats of violence and hate speech on their platforms. May’s speech comes shortly after Facebook CEO Mark Zuckerberg announced a new year’s resolution to crack down on abuse, hate speech and political interference on the site. 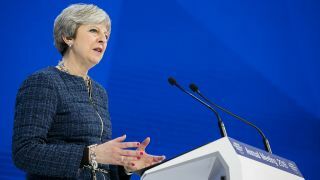 May also set out the UK government’s plans for supporting development of AI. She suggested the technology could be used to make transport infrastructure safer and stop the spread of disease, and said the government would put particular emphasis on supporting new businesses. "We have seen a new AI start-up created in the UK every week for the last three years, she said. “And we are investing in the skills these start-ups need, spending £45 million to support additional PhDs in AI and related disciplines and creating at least 200 extra places a year by 2020-21." AI and robotics are among the key themes at this year's conference, with other topics including the ethics of self-driving cars and robots in the workplace. The World Economic Forum is a nonprofit organization dedicated to “improving the state of the world.” It holds events throughout the year, but its annual meeting at Davos is by far the biggest, bringing together politicians, business leaders, economists, religious leaders and other high-profile figures to discuss global issues. Each year’s conference has a theme, 2018’s being “Creating a shared future in a fractured world”. Other themes discussed so far have included climate change, energy generation and public health.